Scroll down this page to see a list of some of the people who will be participating in the 23rd Avenue Artwalk & Street Celebration. And, yes, these people either live right here on 23rd Avenue, or have another close connection to our street! We are a professional dance company determined to bring high quality and positive dance experiences to children, youth and families in Alberta. We create performances and educational residencies for young audiences. Three Left Feet offers residency programs to schools across the province. Our syllabus is designed to accommodate a wide range of specialty streams, needs and school sizes. Three Left Feet is a touring performance company, with a repertoire of creative works for young audiences. We perform our works in schools as well as at Children's Festivals and other family-oriented events in Alberta and Ontario. For the last sixteen years Three Left Feet has traveled across Alberta bringing interactive dance to children in a fun and innovative way. Students and teachers have jumped, clapped, and stomped their feet. Full participation for everyone! Three Left Feet reaches beyond the physical boundaries of schools and theatres to transform the imaginations of future generations. Running an amazing year-round market is an art form all its own, so we're happy to welcome the Crossroads Market to our list of participating "artists"! Crossroads is more than just a local business - it's a neighbourhood landmark that brings great community spirit to all its endeavours. With typical generosity, Crossroads is bringing the market to 23rd Avenue! Our celebration will include a market stand featuring free fresh fruit for artwalkers to sample. After you taste that, you might just need to stroll over the market for more... (Crossroads Market is located only a few blocks away at 1235 - 26 Avenue S.E.). Almost ready to set up Crossroads' fruit stand on 23rd Avenue! The Leaf Ninjas live and farm right inside of Inglewood and Ramsay... and the base for our urban farm just so happens to be located right on 23rd Avenue. You will be able to come inside to see our farm workshop and tools base, our DIY walk in cooler, and one of our farm sites fully in production. Not to mention; in keeping with the theme of the event, we will be beautifying our garage/ workshop by painting our door during the Artwalk! That' s right, live food and live art right in the same place on September 22nd. We look forward to seeing you then. We've just learned that our resident glass-blowing team will be part of the Artwalk! Here's just one sample of Brenda's unique work. 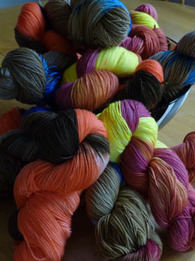 I like to play with yarn. I mess around in my kitchen making it different colours. I like to take it (and other folks' coloured string as well) and make pretty things or useful things. Sometimes I make things that are both! I'm amazed that you can wear something made of a series of loops created with a couple of pointy objects and some string. Andrea Mann began her career as a visual artist, and her films draw from this background in tactile visual forms and collaborative processes. She is interested in psychology and cultural anthropology and has created seven films ranging from 1 minute to 50 minutes long exploring themes in this vein within both documentary and dramatic formats. 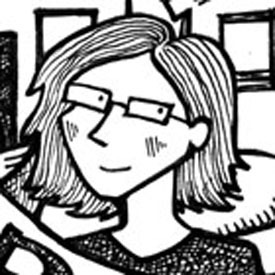 Sam Hester writes autobiographical comics stories. These days, she is getting her inspiration from being a mom in Ramsay. Her monthly strip can be seen in the Ramsay newsletter. Sam also works as a portrait painter and muralist. Served hot right on the Avenue! It's not all about the artists. All 23rd Avenue residents are invited to show off their talents, so we're happy to add our local scientists to the celebration! Under the big tent at the east end of the street! 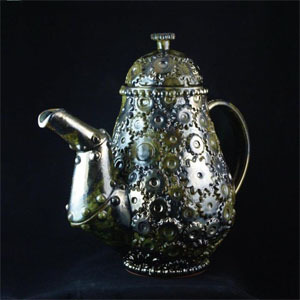 Andrew Tarrant's Calgary- based ceramic work has earned him international acclaim, so we are proud to have him right here on our street! 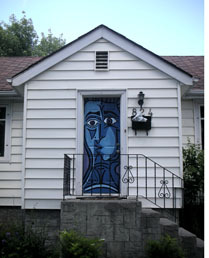 Matthew's Picasso-inspired blue door has become a neighbourhood landmark. It's just one example of his work as a painter of portraits and abstracts. 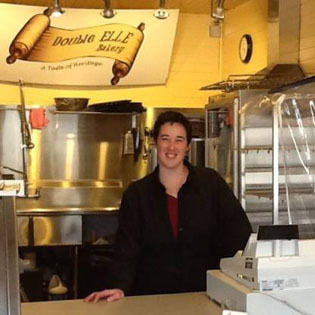 23rd Avenue's Double ELLE Bakery is owned and operated by Leah Layden. Leah was born and raised in Central Alberta and has lived in Calgary since 1996. Leah has baked since a very young age and has the privilege of being taught by both her grandmothers as well as her mother. Nadine's amazing garden is just one of 23rd Avenue's really lovely inner-city gardens. 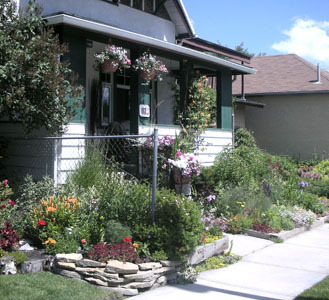 The south-facing side of 23rd Avenue is a gardening showcase - you won't be able to resist stopping to have a look. 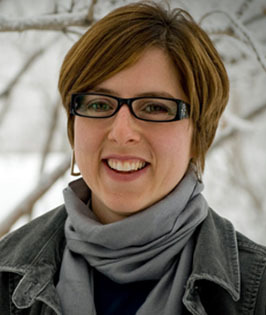 Heather Stump is a Calgary-based printmaker and art therapist who got “hooked” on stories at an early age. Years later, Heather’s artwork often revolves around the concept of story; from the narrative elements present in her imagery to the artist books she creates to contain them. She even makes a living mostly from listening to people’s stories—and the threads from these tales-- interwoven with the threads of her own, often show up in her artwork. Heather currently teaches printmaking workshops at Alberta Printmakers in Ramsay and has a private practice as an art therapist. We'll set aside one front lawn for kids to hang out, draw with sidewalk chalk, enjoy some snacks, and visit with a fairy-tale princess! And yes, this is a picture of our actual fairy-tale princess! You can find out more about her, here.